Here's a new-to-me brand and line! 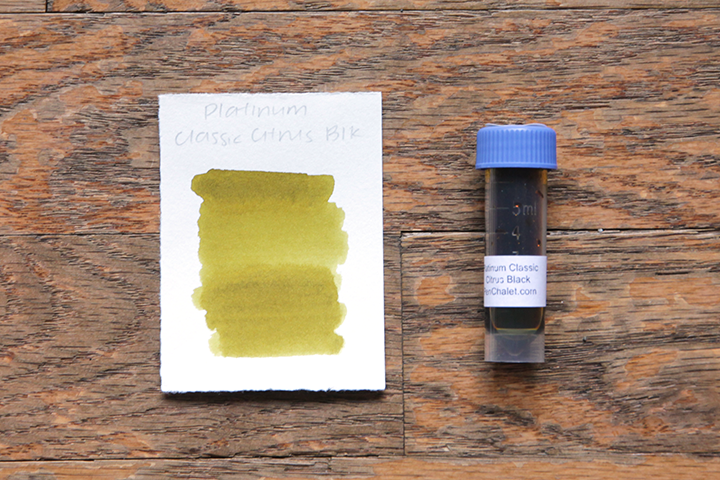 Platinum Citrus Black is part of the company's iron gall ink line. There are six colors that are very unique—I don't think I've ever seen a red iron gall ink before! If you've never heard of iron gall inks, they're an ink that was historically made from oak galls. Modern formulations aren't as acidic and are safe to use in fountain pens (as long as you get ones specifically formulated for fountain pens! ), though most would recommend cleaning out your pen regularly if you do use an iron gall ink. Iron gall inks change color as they dry, and Citrus Black is no exception. When wet, it's a bright, green-tinted yellow. Once dry, it's closer to an old gold color. This ink has a decent amount of water resistance when freshly dried. A lot of it gets lifted, but some marks stay behind. It has better water resistance the longer it dries. 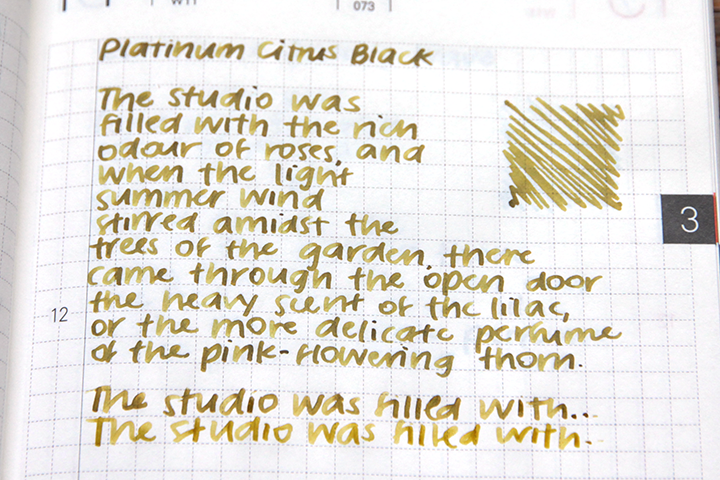 Citrus Black dried very quickly on this Kokuyo MIO paper! It was done in the medium nib before the 30 second mark. It has some shading, which definitely helps to make it easier to read. On Tomoe River paper, the shading is very evident. The last two lines were written fresh, while the paragraph was written several weeks ago. When newly dried, it's a bit more brown. It takes on a more green hue as it dries. Unsurprisingly, I don't have much this is similar to Platinum Citrus Black. 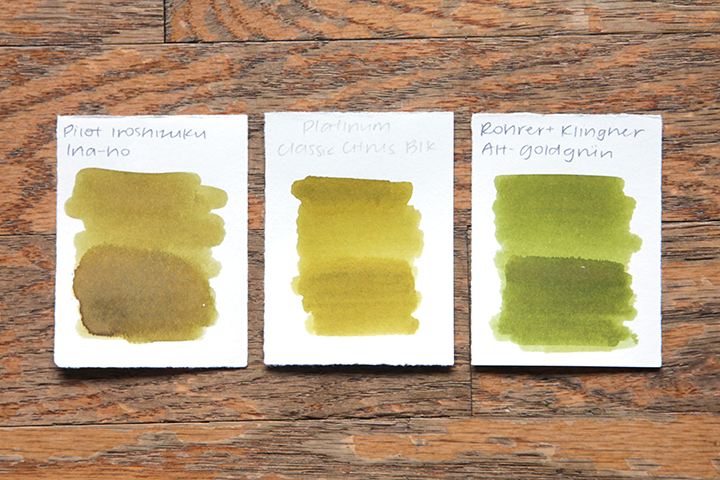 Pilot Iroshizuku Ina-ho kind of looks similar here, but it leans more green-brown and looks quite different in use. Rohrer & Klingner Alt-Goldgrün is much more green. I have this ink my Lamy Safari Petrol with a broad nib. Citrus Black is slightly dry, but it flows reasonably well in my Safari and the two don't seem to quarrel much. Not a bad combination! 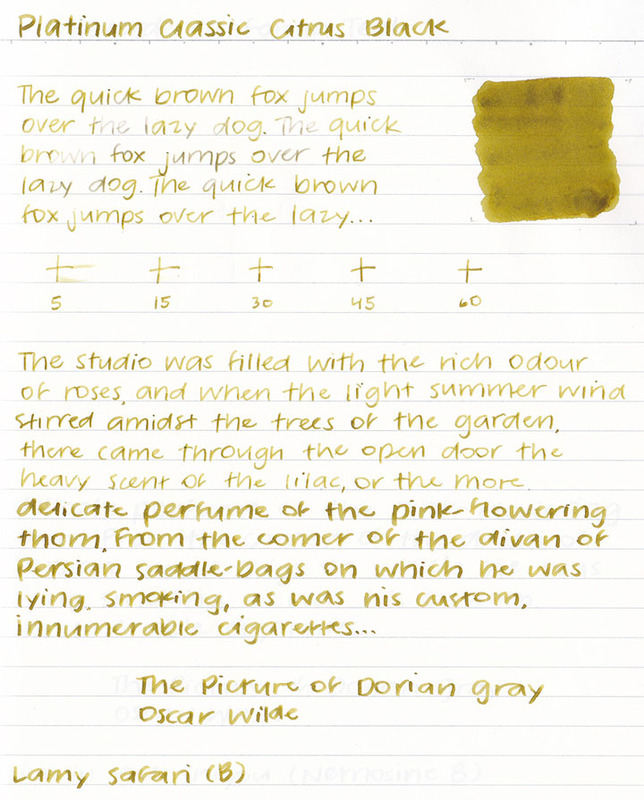 I am strangely enamored with this ink. I'm not a fan of yellow inks in general since they're quite difficult to use, but I love the color Citrus Black dries to. I've never been the most wary of letting inks hang out in pens for a while, but with iron galls I would definitely take a bit more precaution. My pens tend to stay inked for at least a month, so I don't think a bottle of Citrus Black is for me!